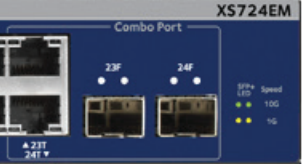 The reason I went with the Netgear XS724EM was that it met all the requirements that I needed for the SDDC lab. This allowed me to connect all ports for the 4 Supermicro E200-8D including the OOO management port, the dual 1G ports and the dual 10G ports, leaving 4 free to be used for the GL-AR750S and the NEO2. This left the remaining 2 ports which are shared between ports 23T/24T (copper) and 23F/24F (fiber) to potentially use for uplinks. Cabling wise each server is directly connected using CAT6a cables through the middle of the case with the cable connectivity like this.